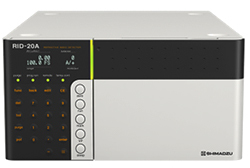 Inheriting the stability and extensibility that are the strengths of the Prominence series, the new RID-20A model of differential refractive index detector is designed with a new reference-cell auto-purge feature and validation support function. The RID-20A reduces the time to stabilization after power-on dramatically by utilizing dual temperature control for the optical system. 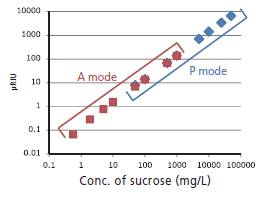 The stable baseline provides the accurate analysis of the molecular weight distribution. The optical system is housed inside a dual-temperature-controlled block. 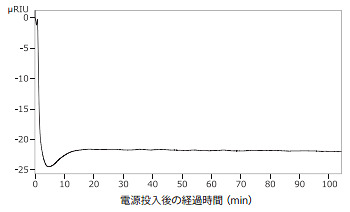 The temperature of the incoming mobile phase is controlled in two stages; consequently, the stabilization time is significantly shorter than with conventional systems. This dual-temperature control also helps significantly reduce baseline drift, thus increasing the reliability of analysis data. The four-partition photodetector in the RID-20A allows a wide refractive index range (0.01 to 5000 μRIU). The single detector supports all applications from highly sensitive measurements to preparative measurements using the three operation modes shown below. The detector element of the RID-20A is partitioned into four parts, and the parts used can be changed electrically. In A mode (for high-sensitivity analysis), the partitions are grouped left-right (combinations of A+C and B+D), and in P and L modes (for preparative analysis), the partitions are grouped top-bottom (combinations of A+B and C+D). 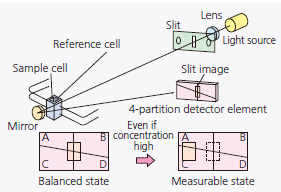 In P and L modes, because measurement is possible regardless of the position of the element's center line, large refractive indexes for high-concentration samples can be handled. 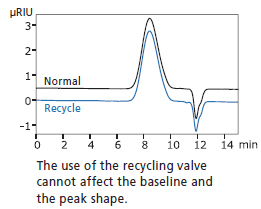 The amount of mobile phase consumed can be saved by returning column eluate to the mobile phase bottle during intervals when no component peaks are eluted. Cost of analysis per sample is reduced and burden placed on the environment is mitigated. The recycle valve kit can be attached to the RID-20A and the SPD-20A/20AV.